For many, purchasing a Garden Shed involves much consideration as to the individual features, size and materials, and while some buyers want something temporary, most want a product that will last a lifetime. Whether you want a simple shed for storage, or something more elaborately styled, we can help set you on the right track before settling on your choice of humble storage space or grand workshop. We will take you through all the considerations ranging from choosing the right size and paint finish, through to extra security precautions, to help you reach an informed decision and end up with an elegant building that fits in well with your garden. The first and possibly best tip we can give you: go and walk around sites to see the sheds for yourself to look and think about what you want and to get a feel of the quality of the construction, as well as the company. The first consideration is, what are you planning on using your shed for? The answer will be the deciding factor in what type of product you choose. Those who simply need a garden storage space for equipment or seasonal furniture won’t necessarily need many windows or insulation. Those looking for something styled more attractively to be a stand-out feature in their garden, or a fully-equipped workshop of a specific size, will want to contemplate buying something more hard-wearing and heavy duty with a longer life-span. The next thing to consider is the price – how much do you want to spend on your new shed? Is it an investment or just a stopgap to solve a (temporary) storage problem? There is a fine balancing act when deciding on the right shed for the right price because there are so many on the market for a wide array of prices. If you want a good quality shed that will last, are you able to wait until you can save more money to buy the shed you really want? It may be worth it in the long-run, so make sure you make the right decision for your needs. A high-quality shed will remain looking better for longer than a cheaper shed, with very little maintenance required in the long-run. Choose features that will make your shed value for money: heavy duty, torched on felt; toughened safety glass; high quality sprayed on paint, dense, FSC® certified timber. Most sheds are positioned in a visible spot in gardens, so how your shed looks is an important point to consider. If you want a shed that you can admire and stands proud in your garden, there are many ways you can add flair to your ideal building. It all starts with where you want the building to be situated in the garden. Do you want to nestle it in amongst trees and shrubs, or do you want it to stand on its own, maybe on a patio? By answering these questions, you will be able to start thinking about potential paint colours – greens will help your shed to blend in with its shrubby surroundings, making it look as though it is a long-standing part of your garden, whereas neutral greys and pale shades will give a subtle natural look. Alternatively, maybe you want to make a statement with darker colours, like black or slate, or even a two-tone building for contrast? Pro Tip: companies who offer the option to paint your shed are experts in doing so. If you are tempted to buy an unpainted shed and paint it yourself later, the chances are that the paint isn’t likely to take to the timber very well and there will be a high possibility of it falling off. It may be a cheaper option, but in the long-run it will become a costly and high maintenance affair. Shed companies know that they must have the moisture content of the timber correct before painting, and do so in controlled environments, as well as applying the correct base coat, resulting in a picture-perfect shed with a paint system that will last. Aesthetics doesn’t just fall to paint colours though, think about window styles (plain, Georgian, leaded), roof overhangs don’t have to just be a practical feature either, and cladding types and roofing materials can also broaden your scope for style options. If you’re still struggling with the myriad of options, another way of thinking about it can be, would you prefer something more traditional, or rustic, or even modern? There are many ways to boost your shed from simple to stunning, and many shed companies will now help you decide upon the right design for you, so be sure to ask for help. 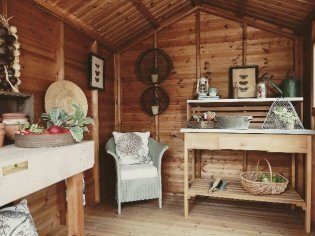 For use as a workshop or hobby room, you may want your shed to be suitable to use all through the year. If this is the case, there are several features that you will need to include in your chosen design to help ensure that your shed is fully equipped for all seasons. For example, insulation in the walls, and even the ceiling and floor will give you the best results and keep you warm while you work inside. Tidy the insulation up with internal lining and make sure the windows are double glazed to really help with temperature control. The ultimate feature to help with year-round use though, is having electrics installed, with lights and plug sockets to provide you with light, power and heat all through the year! Heat is an important factor, as it will keep damp at bay in the winter months. Sheds are often used to store items of value; therefore, security should always be a concern. Whether you just want a padlock or something more heavy duty, it is definitely something to consider for your building. Heavy duty locks are very helpful, but have you ever thought about specialist screws for the door hinges, or protection for the windows? These are important things to think about. Roof coverings may not be an immediately obvious feature to think about, but there is plenty of choice out there for you to be as practical or stylish as you wish. The standard in practical roofing material is felt, but make sure you’re getting a good quality felt! Some companies offer better quality felt than others, so make sure you know what you’re buying. A heavy duty, torched on felt is the best choice and will have a longer life-expectancy. You can also get an array of other materials if you want something more stylish than felt, such as corrugated onduline, cedar shingle tiles for a natural, rustic look, or composite slate tiles. Metal sheeting is quite popular, but it condensates, creating damp over time, and will inevitably rust and become dangerous because of this. Have a think about how the material will fit in with your colour scheme and surrounding garden, and whether you want something more natural, stylish, hard-wearing, or all of the above. It is important that you carefully measure and determine the size of the outdoor area where you want the shed to be placed. Is it going to be big enough for what you want? If not, can you make it a bit bigger or move it to somewhere else in your garden where you have more space? The one thing you don’t want is for your new shed to arrive, and you realise it isn’t big enough! If it helps, why not plan a layout of how you want your shed to look inside? Figure out what you want to go where, and that will hopefully show you if it will be big enough or not, and don’t forget room to expand either! Not many people realise, but without a solid, level and reliable base beneath your building, the estimated lifetime of your shed can decrease dramatically. An uneven or inadequate base means that heavy buildings will ‘settle’ into their foundations, leading to premature deterioration and increased potential for cracks and leaks to occur. There are a few different materials you can choose to make your base from, although some are more reliable than others! Plastic is a cheaper option, but the shed will end up sinking into the material over time. Timber bases can be effective, although try to only put lighter sheds on top! Unless it is a heavy duty timber base, it will eventually fall out of level, which will cause problems with your building. Patio slabs is quite a popular choice, but they MUST be level, otherwise, again, you will have issues with your building over time, including having issues with cracking, and doors not fitting correctly. Concrete is deemed the best material as it is hard-wearing and it can take a lot of weight. It also has a long life-span, perfect if you want a shed to last a lifetime. 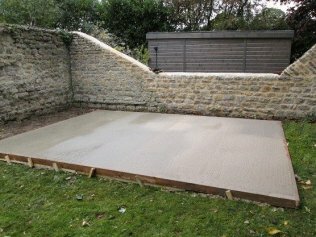 Either the company you buy the shed from will be able to supply you with a concrete base, or you will be able to contact a local builder to come and lay one for you. 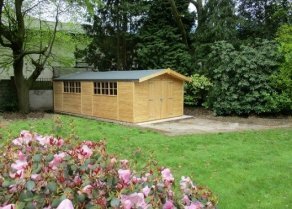 There are multiple materials used for making sheds on the market: some are made from metal, some from plastic, but it is timber that is deemed the best material for the job to achieve the highest quality result, with natural materials, in a traditional style. If you’re looking for a timber shed, many sheds on the market may offer a cheap price tag, but they won’t come with much of a life expectancy. Dense, slow-grown timber is essential for the longevity and strength of your building, so if you want a shed with a long life-span, look FSC® certified timber, as you know it will be a of a higher quality, as well as being sustainably sourced. Some shed companies also have the added plus point of being an FSC® certified company as well, so you know that they take their environmental responsibility seriously. 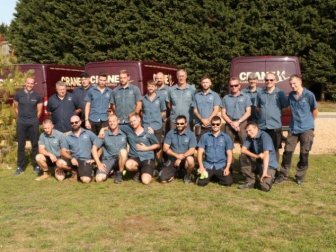 When you are purchasing something that will essentially become an extension of your home, you certainly want to trust the company handling it. The last thing you want is to buy a shed from an unreliable company. Look into companies first, how long have they been around? Do you they have good reviews? Do you know anyone who has had a building from them and can recommend them? As well as putting your own mind at rest about who you are buying from, hopefully this will also build your faith in the product you receive too. That concludes our list! 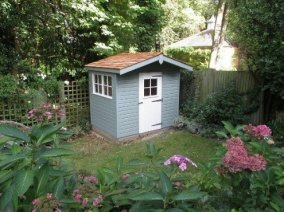 We hope this has given you a valuable insight into what you may want to consider before buying a garden shed. 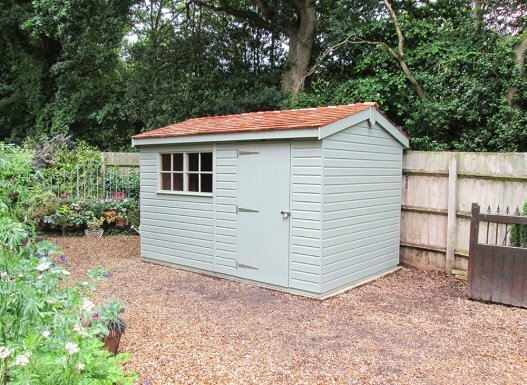 To further assist you, why not take a look at our range of Garden Sheds? We have two shed ranges for you to look at: The Classic Shed offers a simple yet high quality shed in set sizes and several different paint options, whereas our Superior Shed has a myriad of options including a wide range of sizes, with features such as workbenches, guttering, three different paint ranges, partitions, insulation and lining, and even electrics. To find out more, we recommend that you make a visit to one of our UK show centres where you can find a selection of sheds on display and a team of friendly advisors waiting to help. Alternatively, if you prefer, you can get in touch with us online or speak to one of our helpful team over the phone, by calling 01760 444229.